A newborn baby has been filmed appearing to take her first steps just moments after being born in astonishing footage taken inside the delivery room. In the video, the little girl is seen being held up by the midwife's arm as she appears to walk along the counter, with many calling it a miracle. 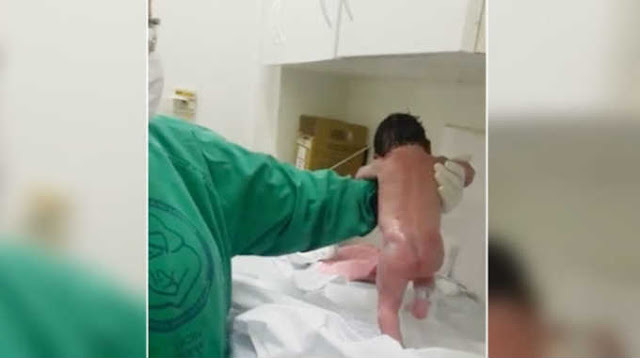 The infant was filmed while still in the delivery room as the midwife took her towards the sink area to give her a wash.
As she is held up on just one arm, she takes clear steps forward, lifting each foot in turn. The woman dressed in surgical scrubs can be heard shouting in Portuguese: "Oh my gosh, the girl is walking. The midwife seen in the video later said he had been trying to give the baby a bath but she had other ideas. According to The Sun, she said: "I was trying to wash her here and she keeps getting up to walk." "She has walked from here to here," she added pointing to the area the child has already covered. The video was reportedly filmed at Santa Cruz Hospital in southern Brazil on Friday, and has been shared numerous times online. It has been viewed more than 50 million times on Facebook alone. Babies typically start trying to walk on their own between the age of 10 and 18 months old. They are usually unsteady on their feet at first, but can move very quickly, according to the NHS. This post was republished from www.mirror.co.uk You can find the original post here.